Posted by Cynthia Brame on Thursday, January 10, 2013 in News. “Metacognition refers to one’s knowledge concerning one’s own cognitive processes or anything related to them, e.g., the learning-relevant properties of information or data. For example, I am engaging in metacognition if I notice that I am having more trouble learning A than B; if it strikes me that I should double check C before accepting it as fact” (Flavell, 1976, p. 232). “A ‘metacognitive’ approach to instruction can help students learn to take control of their own learning by defining learning goals and monitoring their progress in achieving them” (Bransford et al., 2000, p. 18). When confronted with statements like these, most of us recognize how important it is to monitor one’s own understanding while trying to learn. 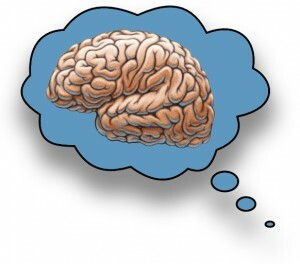 The hard part, of course, is figuring out how to promote such metacognition in our students. I’ve recently been lucky enough to come across several good strategies from different sources. These questions prompt students to engage in the kind of self-reflective processes that will allow them to become self-sustaining learners. 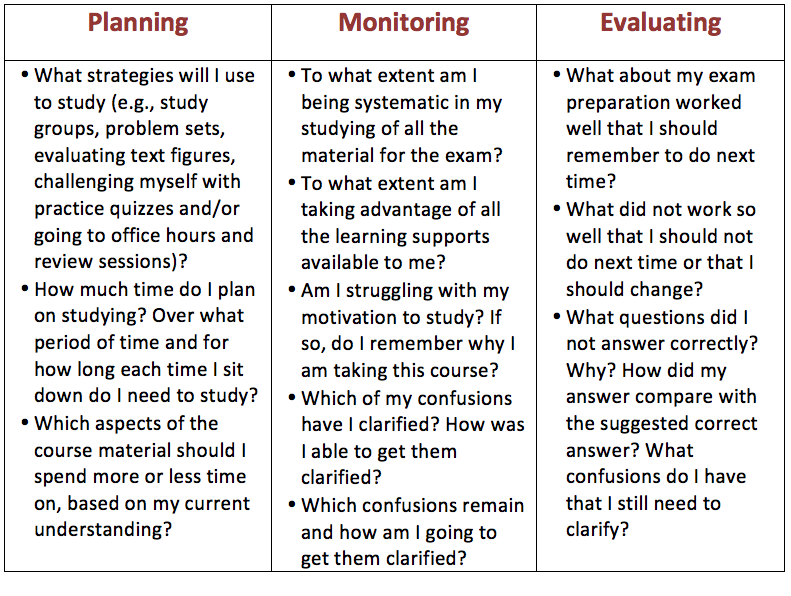 In essence, the questions provide students a roadmap for monitoring their own learning—and while we may wish that they had developed such a roadmap prior to entering our classes, most of us have experiences suggesting that not all of them have. My colleague Nancy Chick, CFT assistant director, uses a similar strategy in her writing classes that she has previously described in a Professor P blog post. Here, though, I want to tell you about another powerful strategy for promoting metacognition that I observed Nancy use when I visited her class. Nancy was preparing her students to do a writing assignment. As she was explaining the assignment, she displayed an image illustrating Bloom’s taxonomy of cognitive functions, which she had clearly shared with the students previously. She reminded them about the cognitive functions, and then pointed to the higher levels –analysis, synthesis, and evaluation—and told the students that this was where they needed to focus their efforts. It was a powerful way to get students to think about the purpose of the paper they were going to write, and by focusing their attention on how they were thinking, I suspect it improved their learning. I’ve recently been participating in beta testing of a Mentor Training for Biomedical Researchers curriculum developed by Chris Pfund and colleagues. Although they didn’t use this language, several of the sessions suggest strategies designed to promote metacognition in mentees. For example, one of the last sessions focuses on promoting mentees’ professional development. One strategy suggested asks the mentee to establish a formal professional development plan, with short-term goals, long-term goals, and a list of skills needed to accomplish each goal. Furthermore, the mentee is asked to identify a potential mentor for each goal as well as an outcome that moves the mentee toward the goal. In essence, the strategy proposed as a good mentoring tool is one big metacognitive exercise—which makes sense, as mentors of graduate students and post-docs are ultimately trying to help their mentees become self-sustaining, life-long independent learners. This spring, I’ll be teaching a Biology of Cancer course for undergraduates. I’ve taught this course before, and I find that one of the big challenges is getting students to put together all the disparate information we have about carcinogenesis, considering what they do and don’t know. This spring, I’m trying out an exercise that I’m calling a “synthesis map.” In essence, the students are going to develop growing visual models of carcinogenesis, using Prezi as their tool; see also Derek Bruff’s blog post. As they learn about an aspect of carcinogenesis (e.g., an overactive signaling cascade, aerobic glycolysis, or epithelial-mesenchymal transitions), they’ll have to figure out how to fit it into their previous model. Constructing this kind of model is hard mental work, and forces one to think about how pieces fit together—and what it means when the answer is not obvious. Since it is such hard work, I’ll have to be careful to make it valuable to the students in ways that they value in the short term (i.e., points) as well as the long term (i.e., learning). Wish me luck! So my conclusion to all of this is that there are so many ways to promote metacognition in our students …and so I’ll probably keep thinking about thinking about thinking as long as I’m trying to teach. Tanner KD (2012). Promoting student metacognition. CBE—Life Sciences Education 11, 113-120.